Thoughts are things, say Theep and Thorpe inside my head. It’s funny how sometimes I hear one or the other, and often I hear their voices together. What does that mean; thoughts are things? I send the question to them with my mind while continuing to wolf down the breakfast lest it magically disappear. Weren’t you thinking about your mom’s pancakes recently? And aren’t those things you’re eating called pancakes? They say in unison. It’s the year 2160. Fourteen-year-old Jonathon Curtis lives on Planet Earth until he breaks the law and is sent to Juvenile Space Camp on Planet Staruus. The planet houses troubled kids from an overpopulated Earth and is thought to be uninhabited, but is it? Theep and Thorpe are enlightened Staruians who are invisible to most humans. They establish telepathic communication with Jonathon because he needs their guidance to gain control of his gift—the power of manifestation. It was misuse of his power and his show-off tendencies that got him there in the first place! Hazel is a thirteen-year-old girl at the camp who becomes friends with Jonathon. She has incredible talent for telepathy and wisdom beyond her years. Jonathon and Hazel discover it’s up to them and their friends at Space Camp to rescue kidnapped teens being held on the planet against their will. They enlist the aid of Theep and Thorpe to accomplish their mission. Jonathon gets caught up in one adventure after another. Like it or not, he’s forced to team up with a bully and confront those who wish to harm him. Will these experiences teach him to harness the power of his thoughts to accomplish his goals? Will he and his friends free the teens in distress or will they end up as captives instead? Lillian Nader, M.Ed. is a resident of Orange County, California, where she enjoys outdoor walks in the beautiful parks and beaches of her area. For mental stimulation, she reads a variety of books, writes for fun and profit, and participates in various groups for dreamers and writers. She is an author, copyeditor, and educator. Lillian can be reached at www.facebook.com/TheepandThorpe. Reader reviews on Amazon and Goodreads are very much appreciated! I found Theep and Thorpe to be such a fun, creative book. It’s important to me that from the beginning of a book it grabs my attention. Theep and Thorpe definitely did just that. It’s the kind of book where you can imagine what the characters voices sound like. When you shut the book, you feel as if you just left the Juvenile Space Camp on Planet Staruus and can’t wait to get back. As I was reading, it was so cute and imaginative that I kept finding myself smile. I highly recommend for all ages. I especially recommend this adventuresome book to the children that dread reading. It’s an adventure that makes you want to read more. The perfect introduction and experience to open up your child’s world to reading. I highly recommend. 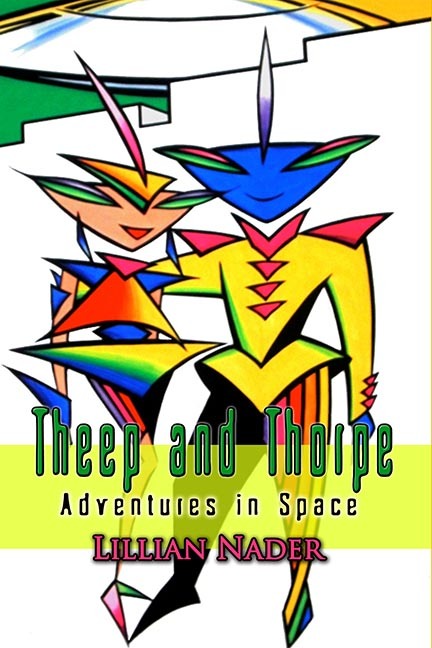 Theep and Thorpe: Adventures in Space is a creative YA novel set in the future. The children are characters that today’s kids can relate to. The dialogue is believable and honest for this age group. It’s fast-paced, and the reader wants to find out what happens next. Ms. Nader has gotten it right. Crystal M.
“Middle grade is not a usual read for me, but I have Grand Kids this age. They are going to love this gift! Beginning with the fashion-forward characters pictured on the cover and flipping speedily through the pages to keep up with the adventures, they’ll race to complete their homework and avoid games indoors and outdoors. next one going to be available? I love the message that thoughts are things. My daughter couldn’t put this book down! She’s 10 and an avid reader. She carried this book with her in the car, to the restaurant and back home – reading the whole time! Ms. Nader has created wonderful characters, an engaging story and a great YA read. We highly recommend it in our family. What an amazing original idea! I had such fun following the adventures of Theep and Thorpe as they are banished from Earth to the juvenile space camp for delinquents on another planet. The author, Lillian, has brought spirituality and space and laughter together to the delight of me, her audience. I am sure you will find the same delight as you follow their adventures. Targeted for the tweens, but such fun for this 67 year old! Congratulations on a winner! Excellent read for preteens. The author expertly introduces New Thought and personal empowerment. Theep and Thorpe are divine inspirations. Highly recommended. A fanciful tale of friendship, teamwork and loyalty. This wonderful book is for adults as well as for young readers. I’ve read it more than once and I get something different from it each time. It’s a very quick, fun and entertaining read, with several lessons that give each of us something to think about, yet it’s not preachy. I highly recommend this enjoyable well-written book to everyone. I look forward to reading about further adventures of Jonathon and Theep and Thorpe. This is a great book for teens. It teaches many lessons without being too direct. The importance of their thoughts and how they treat and understand their peers are presented in a way that teens can understand and still enjoy the story. I Hope Theep and Thorpe continue with more adventures. I love this sweet book. I can’t wait to pass it along to my niece. The characters are clever and have so much personality. It’s well written and definitely entertaining. It’s got heart and adventure. Very creative and clever book for young readers. You might think this is a book for children, but you would be wrong. I spent a delighted 3 hours reading Theep and Thorp with a smile on my face the whole time. I could not wait to turn the page to find out what would happen next. It does teach children valuable lessons in teamwork, friendship and ethics. Buy one for your child and one for yourself, you will not regret it, trust me!!! Refreshingly different. Tailor-made for the young adult market, good lessons without preaching. Strong characters. The light humor that somehow can be found in a juvenile prison colony is refreshing. Nice to have a little sci-fi without people – or other beings – being blasted to smithereens. Nice job, Lillian. Original, well-developed characters make this story a great adventure. We get to peer into the lives of “delinquent” kids and follow their detention on Planet Staruus. When Jonathon is faced with completing a task that could save his friends, Theep and Thorpe ask him a question that echoes the theme of the story. “The question is, can you harness your power to take control for the good of this endeavor? Or do you let your petty jealousy interfere because it was Billy’s idea?” This book is a great way to teach kids the benefits of selflessness and working together. Theep and Thorpe is a fun, exciting read. Fourteen year old Jonathon has enough problems to deal with such as reform school on another planet, a bully, developing supernatural abilities, and alien visits. Can he handle the biggest challenge of all and pull off a daring rescue? The author weaved many elements including space travel, friendship, love, and how our thoughts have power, into the story and kept the reader entertained throughout. I enjoyed watching Jonathon mature, learn to accept his gifts, and find friends in unlikely places. I hope to read more about Jonathon and Hazel and the rest of the kids on Planet Staruus.